Although this K-12 school is intended for children with special needs, its recent redesign has something to teach every school about learning in the 21st century. Twenty-four families have testimonials on a parent page for The Newmark School Web site. No doubt, if more were needed, most of the other families with students at the school would step forward to fill the gap. This New Jersey not-for-profit K-12 school has figured out unique and effective ways to "shape" behaviors in the classroom for its unique population of students, all of whom have some type of behavioral disorder or other developmental disability. However, Newmark's recent move into a new state-of-the-art facility is now showing the education world that it has figured out how to use smart learning space design and technology that could help "any kid on the planet," as Co-Founder and Executive Director Cynthia Allman puts it. Here are five Newmark lessons for creating a learning environment that encourages students to be critical thinkers who are self-motivated and collaborative. 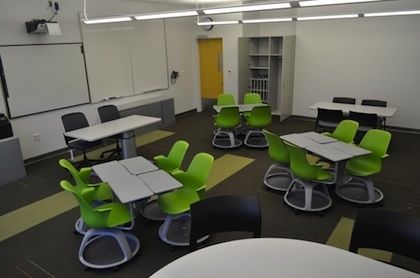 Classrooms are outfitted with Node chairs and media:scape tables, both of which are Steelcase products. The Node chairs are on wheels, can swivel, have built-in desks and a space underneath where students can put their stuff. Compare that to the traditional classroom full of traditional student desks, said Regina Peter, director at Newmark School. "They're designed to hem you in, designed to have you stay in your place and not move." The Node chair "rolls just enough for a kid to be able to have some freedom. It's designed for more self-direction. Our furniture is designed to let kids have that little bit of say-so over their educational process." Furniture at the Newmark School "is designed to let kids have that little bit of say-so over their educational process," according to school director Regina Peter. The media:scape tables allow up to six students to sit with their computing devices and share the use of a puck or button to display whatever is on their individual computers up on the screen. "That's the way decisions get made. It's collaborative. You're thinking independently; you're taking turns; you're reciprocal; it fosters conversation and self-correction," noted Peter. Oftentimes in the special education environment, she observed, "things are so individualized, the kids aren't taught truly how to collaborate." Teachers have learned that instead of facilitating groups, they can send students to the media:scape table "to facilitate with each other. It has been a nice classroom tool that fosters social interaction as well as academic reflection." The results, she added, "have been extraordinary." Now when students need to get into small groups, they don't have to wait for the teacher to tell them to lift up their chairs and move. They know they can manage it for themselves. "It empowers the person to make their own decisions without having the technology get in the way." Newmark has a 1-to-1 program now. Perhaps its modest size — 165 students currently, about 11 students per classroom — makes that practice more tenable. But what isn't typical is the mix of tablets and laptops so the students can choose whatever type of device they prefer and use them whenever they want to. The goal in providing access in that way to those devices, said Peter, is "to prepare them for the world outside of school and keep them as advanced as possible... We don't necessarily have technology replace handwriting. We certainly believe in a lot of sensory components for our kids. But we really treat technology as a tool of learning, just like we would a textbook, a pencil, paper. That's really what our philosophy is." The same philosophy now applies to mobile phones too. Previously, the school would collect the phones from students, "because we felt our kids would really abuse them," said Allman. Now Newmark has "embraced it." The student alliance made rules for phone use: no texting in class; no taking photos of other kids in the school. Now students feel free to pull their phones out during class to get answers, she noted. When there's a question on the board — when did World War II start? — "they'll just pull out their iPhone and punch in that and get the answer. We're going to encourage that. We think that's the way of the world." Steelcase produced a video about the Newmark School as part of a case study. Users assume that the wireless networking will work in the new building. That wasn't always the case with the old locations, said Peter. "We don't have a lot of downtime with the computers or printers. That's been a miracle. It becomes part of the day, and not just managing around it." That seamless integration of technology is crucial in other areas too, added Christine Schlendorf, principal at Perkins Eastman, the architectural firm that designed the entire space. "If a teacher or student is struggling to get the projector on, get the [interactive board] working, the screen working, they will immediately shut down and not use it. [Teachers are] trying to control a classroom of 20 or 25 kids and they can't be messing around with their laptop trying to figure out how to get their lesson up on the board. So it's not just figuring out what technology works best for your school, but how to make the whole system very easy and user friendly." Added Laura Harrington, account manager at DS&D, a company that worked with Newmark on its interior needs, Steelcase has a term for that concept: FUMIFU (pronounced "foo-me-foo") for "First use must inspire future use." "If they can't get it right the first time and they can't use it, they're never going to come back to it." Newmark acts as a "vendor," drawing many of its students from school districts in the region that are unable to accommodate them for various reasons. Because Newmark was showing remarkable results, those same districts and others began reaching out to the school for training on how to accommodate the needs of challenged students in traditional school settings. In response, with its new facility, Peter and Allman opened up the Teacher Training Institute to hold seminars and do consulting. An auditorium space was designed specifically to accommodate that. When individual classes use it, big displays help separate the groups. When the multiple classes meet together or an institute seminar is in session, everybody in the room can get a good view of what's going on from the screen they're closest to. Plus, it uses what Dancker, Sellew & Douglas' Harrington called, "a piece of technology that people don't really consider technology": the simple swivel chair. "So many schools don't have that. They have a fixed seat chair. Once you introduce a swivel chair into any kind of classroom or training room, it allows the user to have eye contact with everybody in the room. Opening up that eye to eye contact creates relationships with people — especially kids with special needs who may be a little bit more socially shy." The hallways in Newmark are "large and wide," declared Allman. "It's meant to be a space for learning; not just a walkway." That helps the school's students in several ways. For one, said Schlendorf, "We wanted to make sure the students were comfortable." Second, added Allman, "We can hold an impromptu meeting in the hallway — a class if you needed to. It gives us the opportunity to train right then and there." The school has an area that includes a game room with soft seating, gaming devices, air hockey and foosball tables and monitors for gaming. That allows the students to use the technology "in a way they're more familiar with but in a format that fosters much more collaboration and social development," explained Allman. "We use that to really train our kids for social skills and social thinking." When the school consolidated two campuses into one in a new location in Scotch Plains, NJ, every teacher had to pack up (and purge) the contents of her classroom and move into a very different physical space that was filled with new technologies. But rather than bringing the teachers in for training on it "then and there," said Peter, "we gave them the basics: how to use the phone, how to turn on the computer." Then the school held its "extended school year," four weeks of summer class time that gave the teachers time to "explore" their new gear. Finally, in August the school held official training. That delay allowed the educators "to have an experience with the products, if you will, before they really started the serious training," explained Peter. "They were a little more invested in it as opposed to not having an experience with it ahead of time." The training continues, but now it's done with small groups primarily attending webinars set up directly with education experts from Steelcase, for example, who can answer specific kinds of questions. Meeting Physical Needs is "Half the Battle"
Newmark pushes the idea that when students' physical needs are met, learning is easier. "This applies to all human beings, but particularly with the behavioral kids we have. If we've met their needs physically, we've won half the battle," said Allman. The integration of unique forms of furnishings and the use of technologies "has afforded some very vulnerable kids to become participants in their own learning and to feel like they have more control and more investment." "Learning just needs to be flexible," Peter said. "We have a nice balance of that here."